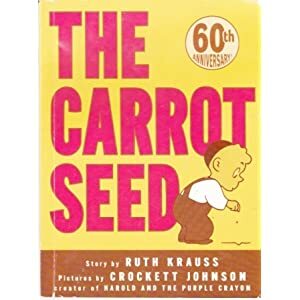 Have you ever read the Carrot Seed? I couldn't help but think of this favorite story of ours when I came across some pictures of a little incident with Elisabeth. Last week, Ellie was emptying the dishwasher when these two cups got stuck together. She brought them to me and asked that I separate them. Pull as I did, they would not separate. Next, she worked her way through the ranks having everyone attempt to part them. Elisabeth made it all the way to Pa, but no one could part these two. Next, we tried running the cups under water and coating them with dish soap. Failure on both counts. Don't ask me why, but finally my persistent girl got it in her head to put them in the refrigerator. The rest of the evening she periodically ran to the fridge, opened the door and loudly announced they were still stuck together. When Allen and I were heading to bed, we stopped in the kitchen to fix ourselves some water. I saw the cups and started laughing again. Then I decided to give them a tug. And guess what... it worked. They slipped right apart. Not wanting to spoil her fun, I put them back in the fridge for her to discover herself. The next morning, she wasn't surprised at all when she opened the door. It worked. Just like she always knew it would. Oh, the mind of a little one. She had no doubt!